If you’re off to battle an evil wizard, what’s better than a sword? Twin Swords! And even better again are twins with swords. 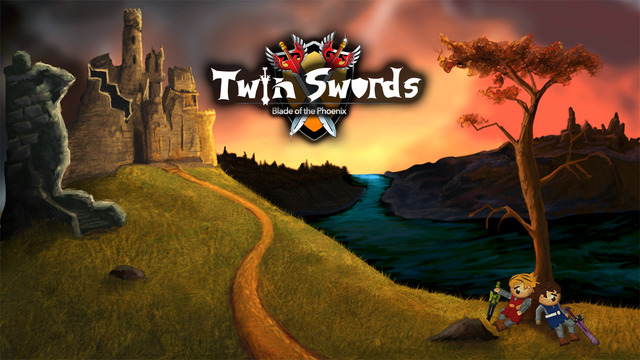 In the game Twin Swords, available in the app store for IOS, that’s what you get. 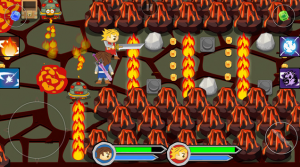 You control two sword-swinging characters in a highly addictive, fun adventure. Set in the kingdom of Glandur, the story begins with Princess Leila, out innocently gathering flowers for her brother – Prince Edwin – when she is kidnapped by the Dark Wizard, who wants her royal blood for his immortality potion. Edwin and his brother Baldric vow to rescue her and so embark upon an epic adventure. They plan to forge a powerful sword, ‘The Blade of the Phoenix’, to use in defeating the wizard. But their journey will not be an easy one; they will encounter monsters, traps, riddles and mazes along the way, left by the wizard to confound their progress. 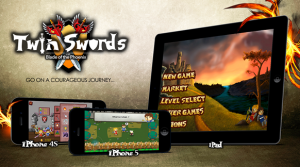 All Twin Swords’ controls are on-screen for iPhone and iPad. To move around there is a simple joystick in the lower left corner. This takes a little getting used to, especially on iPad, as when you’re holding the tablet it’s a little awkward for the thumb to smoothly work it; but no problem if it’s on a surface. The action button, bottom right of the screen, is used to fight or interact with people and objects; with it you can destroy the annoying purple toadstools that appear on your path, or get information from the other characters. Pressing and holding the action button allows you to throw your sword, a great way of avoiding any damage when engaging an enemy. And the evade button lets your character roll out of the way of an attack or obstacle; also very useful when you’re trying to keep two characters alive! On the sides of the screen are slots for any magic spells you might collect on the way, with Edwin and Baldric’s spells kept separate. All through the adventure you can switch which brother you control by pressing their icon, beside their life bar at the bottom of the screen. Green emerald gems are redeemed for health after a tough fray. Blue sapphire gems get you magic points or Mana. Most important are the golden gems you collect on your journey, either lying around or when you destroy an obstacle. You can use these to purchase new abilities from the market, which you will need as the challenges to be faced get harder and require new skills. There are 44 different and challenging puzzles to be solved in the game, making it about more than just swordsmanship. Brain as well as brawn is required to progress in obtaining a cache of weaponry, from The Glorious Blade right through to The Blade of the Phoenix. The charming character design and detailed backgrounds make for a smooth, enjoyable gaming experience. And the imagination put into the magic portions, like when you unleash the ultamean lions, is sure to keep you entertained and involved. The level Bosses’ design show the painstaking effort put in by the developers P-O-M. Twin Swords is just different enough to be enthralling, yet familiar enough to dive straight into for an epic adventure – watch out, Wizard!